In a manner befitting for a flagship, the freshly announced Samsung Galaxy S III will storm the market with a serious entourage of original accessories. 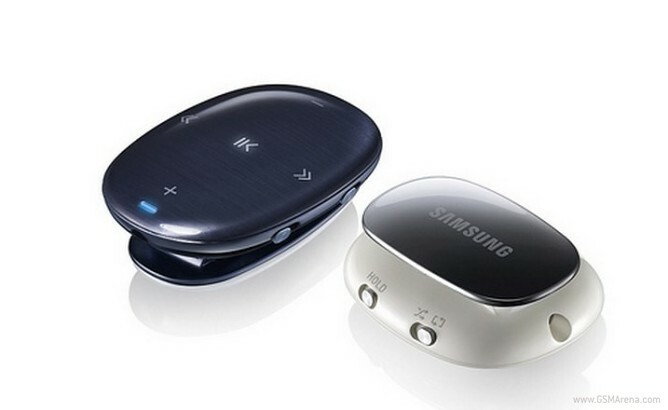 They range from a flipcase, all the way to a wireless streaming dongle. Here’s a quick look at some of them. We will begin with the S-Pebble MP3 Player. The tiny music player which looks like, well, a pebble, will be offered in the the same two hyper glaze colors as the Android powerhouse, and will aim to replace the hefty sized smartphone during your workouts. With 4GB of built-on memory and 17 hours of battery life. MicroUSB port will be the connection between the little gadget and your computer – nothing fancy here. The AllShare Cast wireless streaming dongle is next. The palm sized accessory connects to your HDTV via an HDMI cable and does a great job in direct mirroring the action from your precious Galaxy S III to your TV set. It also plays nice with Polaris Office, and enables you to use your handset as a controller, while doing presentations. The flipcase is pretty self explanatory. We’ve seen the same design and material used in cases for the Samsung Galaxy Note, as well as the Galaxy Tab 7.7. Pricing and availability of the Samsung Galaxy S III accessories is yet to be know. We are reasonably confident however, that it won’t be long till we find out.